Choosing Joy: Rhett is SIX months old! Rhett is SIX months old! You turned six months old last week. I really can't believe how quickly time has passed. I just had you at the doctor this morning so I was waiting to post your stats on this post. -You weigh 13 lbs 12 oz. This made momma sad because it meant the end of breastfeeding. You've been exclusively breastfed your whole little life until noon today but our pediatrician is concerned about your growth and wants to see if it will increase on formula. My goal was 6 months of breastfeeding (only made it 3 with Hudson) and I surpassed it by a week! I was worried how you'd do with you first formula bottle and you took it like a champ. -You are 25 inches long. -You are in 3 month and 3-6 month clothes. -You are in size 2 diapers, but we are using cloth except when you are being left with someone else. -You've been extremely fussy lately, we think you're teething but have yet to see that first little tooth pop through. 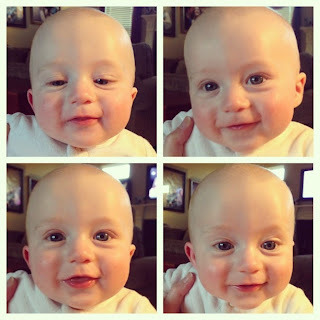 -You are getting so close to sitting up and you love to roll and scooch all over the place. -You love baby food. So far I haven't found anything you don't like. -You adore your brother. You watch everything he does. I can't wait for y'all to play together. -You giggle and coo all the time. You are usually SO happy and easy to entertain. We love you so much. You and your brother are the absolute light of our lives.